"Hi I just got a rubber tree and don't know anything about them. I got it at a flee market and came w/ no. lit. Wondering some basics. Water light fertaliser(sp) and some more if possible. I also have a 3' Yucca and has been jamming in front of my sliding glass door till 3 wks. ago. I have had it for 3 yrs. or so and has been doing awesome in the last 8 months. Till it has just lost 75% of it's leaves. I don't understand. should I cut it and let it start again if so how do I do that???? Well My name is Harrison and I would be very thankful for what ever you might add as advice.... Thanks Harrison"
I will assume that you have a Ficus elastica, because it is the most commonly called Rubber Plant. Rubber plants like bright light, but never hot sun. When your new leaves are emerging, even less light is advisable, as this will promote larger leaves. Rubber Tree Plants are very susceptible to changes in environment, such as moving the plant from a warm to a cool room. 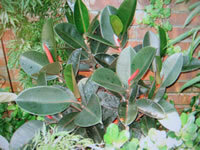 Keep your Rubber Plant out of drafts, and away from heat sources. Keep your plant evenly moist during the growing cycle in spring and summer, but on the dryer side during the rest of the year. use a ½ strength mixture of a soluble house plant food. Rubber Trees really appreciate having their leaves sponged off with a damp cloth. Rubber Plants have a tendency to lose their lower leaves, usually from environmental reasons. If this happens very often, new shoots will emerge from the old leaf node. but be sure to not to cut to deeply. "My husband has an out of control rubber plant that he is very attached to. He's let it grow unchecked, and since we live in a small house, it really is cramping our (ok, mine more than his) style. I wouldn't mind it so much if it didn't take up 1/4 of our living room! The shoots extend about 4-5 feet in every direction and it seems to be growing (very robustly) horizontally instead of vertically (the plant is about 4 feet high). Is there a way to safely prune this plant without damaging it? If so, how do I go about encouraging a tighter, more vertical structure to the plant? I'd appreciate any advice or helpful links, as I don't have much of a green thumb!" The branches of your husbands Rubber Tree can be cut back to an appropriate length, using a sharp clean knife, or very sharp pair of pruning clippers. Rubber Trees have a tendency to bleed a lot of sap when they are cut, so I would recommend that you have some Roottone® or Hormonex® handy to cover the fresh wounds. (these products will aid in the callousing process). When you cut the stems of the plant be aware that it will more than likely branch out from that point into two or more new stems, making a bushier but larger plant. The horizontal growth more than likely indicates that the plant is getting insufficient light. If it isn't feasible to move the Rubber Tree plant to a brighter area, I would suggest that you use an overhead fluorescent or flood type Grow Light which will encourage vertical growth. Gradually you can train the existing stems into a vertical position using stakes as temporary supports, but don't try to force the branches to quickly because they may be damaged. It sounds like there has been some sort of trauma to the plant, probably at the root level. Is it possible that it has become overwatered, causing the roots to rot. Yucca is also susceptible to root mealy bugs. I had a yucca once that seemed to die overnight. I gave up on it, cut it down, and forgot all about it. The next spring I had about a dozen new Yucca plants coming from the abandoned root stock that was left in the ground. Its very normal for the lower leaves of Yuccas to die off, but for your plant to lose that much at once, there is definitely something wrong. I wish I could be more help, but this is one of those times I would really need to examine the plant in person.